Thursday, 23 June 2016 By Marchetto Pellami S.p.A. 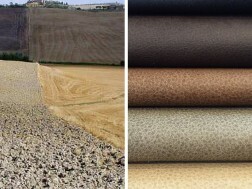 The gentleness of the Sienese hills and their soft colour contrasts, have inspired the creation of a new shade of the most exquisite aniline leather, manufactured by Marchetto Pellami, called, ça va sans dire, Siena. Launched a few weeks ago, it is already appreciated by the world of furniture and leather sofa manufacturers. They wanted a ductile and precious material, able to enhance the grain and natural characteristics of leather, and thus evoke the warmth of old farm furnishings, such as large, intense tone leather sofas, stone walls and exposed beams. Siena aniline leather by Marchetto Pellami being a deep chestnut brown, can be transformed into sofas with large, wraparound seats, for an exclusive, chic country style. Other shades range from beige and brown/ dark brown, to greys and blacks. The Aniline Siena is a living material, that changes and becomes more beautiful with the passage of time, exposure to light and use. Like the area around Siena, with its clay reliefs and ravines, and with its rugged landscape , that makes an already fascinating part of Italy, even more alluring.